Mechanical Valentine Girl with Baby Carriage The Jointed Paper Doll Family Series by Carolyn Chester was found in The Woman’s Magazine in 1913. Mechanical Valentine Magician with Parrot is trying a Trick with Monkey and Mice New England Botanic Medical & Surgical Journal. Semi-Monthly. Calvin Newton, M.D., Editor and Proprietor. Vol. III. No. 9. Worcester. Printed by Henry J. Howland. 1849. Mechanical Valentine Magician New EnglandBotanic Medical & Surgical Journal. Semi-Monthly. Calvin Newton, M.D., Editor and Proprietor. Vol. III. No. 9. Worcester. 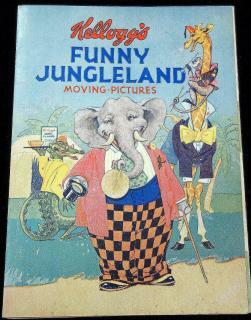 Printed by Henry J. Howland. 1849. The book features six (6) pages of sliced animals in 6 pieces to provide numerous, hilarious combinations of heads, bodies and feet when flipped about. There are also little verses that pair with the illustrations that give some context, which also happen to mention Kellogg's various cereal products as well. Measures 8" x 6". . 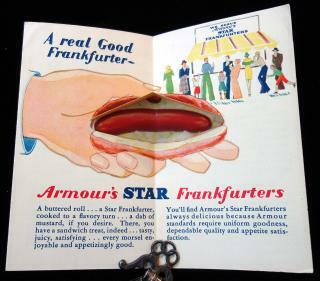 The front panel features a drawn colored illustration of men, women, and an automobile waiting in line for Armour's Star Frankfurters. The inside panels features a colored illustration of a pop-up roll revealing a frankfurter inside a bun. Below the pop-up are a few paragraphs promoting the hot dog. The rest of the inside panels are dedicated to six recipes that utilize Star Frankfurters in them. The recipes listed are: Star Frankfurters and Potato Salad, Star Frankfurter Rolls, Cooking Star Frankfurters, Star Frankfurters and Baked Potatoes, Casserole of Star Frankfurters and Potatoes, and Roasted Star Frankfurters. Next to the recipe is another colored illustration depicting a plate of frankfurters and an unopened a package. On the back cover the numbers 120722 are printed along with "patent pending." Measures 5" x 3" (folded), 11 1/2" x 3" (unfolded). Uncut Playset - Six Kut-up Toys – All Mechanical, illustrated by Medford Thorne. Fisherman, Sawyers, Pin-wheel, Elephant, Duck Rocker, and Tiger and Monk. Copyright 1930 Hank Hart Pals on Our Farm. New York,Animated Book Company,1944 . ..
Six heavy card stock mechanical toys in a paper wrapper. Kut-up Toys, All Mechanical for Boys and Girls, New, Novel, Durable by Mechanical Kut-Up Toy Co., Manufacturers, Los Angeles, CA. Diorama-style children’s book with ten (10) die-cut movable animals A 11 1/2" x 9' ” heavy card stock fold-out diorama-style barnyard scene. Includes ten (10) different easel back, mechanical animals, each with a printed verse. They are Wooley the Sheep, Gobbie the Turkey, Dobbin the Farm Horse, Hissie the Goose, Gruntie the Pig, Shep the Dog, Rex the Pony and Mooey the Cow, plus a die-cut donkey with a duck and a goat with a chicken. Complete. . Wear from handling, intact tear at base of fold-out. Little Leprechaun Valentine Mechanical Marionette Toy - Raphael Tuck Mechanical Lotto Cards. ..
An 11" x 9" embossed die-cut mechanical marionette paper toy by Raphael Tuck & Sons. Ltd. Each card from a French lotto set has four (4) mechanical parts, that move to reveal the lotto numbers. Great whimsy.Measures 5 ¼” x 8 5/8”. Light edge wear. Unpaginated. Introduction by F.E. Weatherly. c1897. Three (3) double page pop-ups including Neddy’s Friends (farm scene), Bunny-kin Town, and Wild Indians. The first scene has creases in donkey's head and dog leashes at fold. Second (center) pop-up detached (pulled away from staples) from book, but present. Cover and edge wear from handling. Light warping on cover. Measures 7" x 7 1/2".